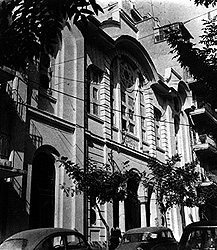 The Monastir Synagogue in Salonika was built by Jews from Monastir (a town in the former Yugoslav Republic of Macedonia, near the Greek border) between 1925-27 and was designed by the Jewish architect A. Levy. The two-storey structure includes an impressive façade in a combination of styles with a two column arcade leading to the main entrance. The top of the façade is decorated with Stars of David. The central hall is surrounded by additional halls and rooms. The Bimah is located on the east side and facing it is the two storey Aron Kodesh in the neo-Classical style, both made of white marble. On the yellow painted walls surrounding the central hall, and on the capitals of the columns, white stucco reliefs in floral motifs and Stars of David can be found, as well as boards with prayers and blessings. The Monastir Synagogue is the only synagogue in Salonika that was not damaged during World War II, since it served as a warehouse for the Red Cross. The synagogue was damaged in the earthquake of 1978 and was repaired with the help of the governmental authorities. 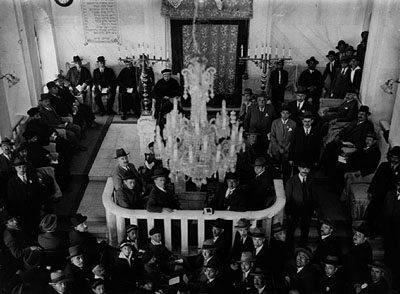 Today, the Monastir Synagogue is the central synagogue of the Salonika Jewish Community and an official historical site. The synagogue is open during the High Holidays and services are held on Friday nights and Saturday mornings.